Since long ago Twitter isn’t just a small social networking startup (in technology time frames of course). Its not the little company that struggled to endow its messages (in 140 characters or less) anymore, but a gigantic global community that assist expelling dark regimes and yes, it is also a high-and-growing revenue business. But before getting into the explanations let me first bring you the data- According the the Twitter measurement tools site Twopcharts, two days ago Twitter has passed the 500 million registered users milestone. The site already began counting for the 600 million user mark, predicting it will happened in 102 days from today (on the beginning of June). 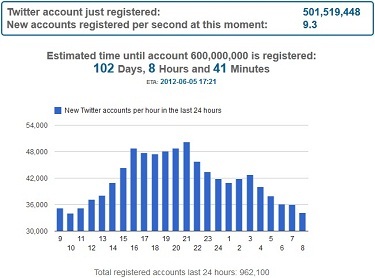 Twopcharts also providing the following stats: In each second, more than 9 Twitter are being created, over 960,000 new accounts have registered in the last 24 hours and the busiest account creation times of the day are between 16:00 to 21:00. But leave aside the doubtful measuring, the total number includes also deleted accounts (Twopcharts assuming they are about 12% out of the total). Moreover, the number is referring to REGISTERED users and not for ACTIVE users- Twitter is suffering from an enormous amount (estimated by 45% out of the total) of “zombie accounts” that sometimes that never even sent one Tweet. So when taking under consideration those things, the total amount of active users is dropping to 242 million users, which is still highly respectable. Just for proportions, LinkedIn has announced two weeks ago that it has more than 150 million members. But does 242 million active Twitter users is a realistic number? Let’s try to find out. The last time Twitter released an official number was in September 2011, where the company announced they achieved 100 million active users. According to multiple research and analysis sites (Compete, Quantcast, Alexa, comScore, Experian Hitwise), since then and until now Twitter’s traffic rose by 25%-50% and its higher by about 10%-20% than LinkedIn’s. Although it is far from certainty, when considering these stats Twitter probably has about 150-200 million active users.